Many Meta users have asked for statistics that involve data that isn't available through the public data dumps (especially voting-related stats). In conjunction with the SE team, I will be bringing the community these statistics! I've have been granted access to all the relevant public and private data on the network, so a complete and in-depth data analysis can be presented to the community. First, I need your help -- which sets of statistics would you like to see? Note that the statistics don't have to involve private data (if possible, I will provide equivalent SEDE queries). Also, it would be nice if each statistic could be presentable on a graph for easier consumption (i.e., for a blog post), but this isn't required. I'll tackle the most popular/interesting requests, so please vote for the stats you'd like to see! For those who made suggestions for statistics based on question views, I have bad news, unfortunately: Jeff informed me that detailed view data is not stored in the database. Although these stats won't be presented, thank you very much for your suggestions! I think it would be interesting to see what percentage of questions are migrated to another site and subsequently closed on the target site. This might need to be split by close reason on the target site because how I see it, closed as duplicate is an acceptable close reason but the other close reasons are "bad" ones and possibly indicate the question shouldn't have been migrated. On Server Fault it certainly seems like we close a fair amount of questions coming from other sites for one of the "bad" reasons, but I don't know if I'm exaggerating the problem in my head or if an actual problem exists. This isn't private data so it can probably be done with a SEDE query, but I'd like to see some statistics around tags and Unanswered questions. In particular, I'd like to see which tags have the highest numbers and highest proportions of Unanswered questions. Related to that, there are certain tags like regex that are used in conjunction with many different tags often enough that it would be interesting to see what impact it has on Unanswered questions. For example, which language + regex combination has the highest proportion of Unanswered questions? On (rare) occasions I'd like to see view statistics. Maybe only for questions with huge view counts, when wondering when those views happened, and what caused spikes, if any. It would be nice to see a breakdown of how many known and anonymous users are viewing. ChrisF also asked for referrer details in Is there any analytics information that moderators can access for individual questions? I would like to see more tag stats (I'm sure SEDE already has a bunch). Views, votes, answers per question for each tag. This would allow us to compare tags better and also see which tags actually draw the largest audiences. It would be interesting to see the rise and fall of certain tags over time and allow us to 'focus' some more attention on topics that are trending (with the blog for instance). It also surprised me that the OSX and Linux/Ubuntu tags on SU are still on the rise, even though we have dedicated sites for those topics. Tags that draw the most new users, split up for answers and questions. When browsing SU, I always wonder which topics should deserve more attention, because they're the life blood of the site. It would also give us an idea about what topics might need some additional moderator attention, because new users often means 'trouble'. Which tags or specific questions (like a top 50) attract the Google masses. While we mods can see where our traffic comes from, we don't actually know how where they go to. It might be impossible to to predict which questions/tags are of the most interest, making sure those posts are our top priority surely doesn't hurt. Furthermore, I'm curious how the views are distributed. Are some tags only popular with registered users and de certain tags get dis-proportionally attention from random Google visits. Is there any information about what question made users sign up? Like what was the last question or first question they watched before deciding to sign up. I'm just curious as to what might make new users decide to create an account in the first place. software-rec get's nearly 6-7x the votes the other tags are getting even though it only has twice the amount of answers/question. Even though there are huge differences in the number of questions, the differences in views/questions are much less dramatic. For example: windows-7 has 10x the amount of questions as osx-snow-leopard but there's only 110 views/question difference (10%). multiple-monitors These are all topics that are often hard to troubleshoot and are something you'd expect StackExchange to excel at, whether we actually provide a solution is a different question entirely. Can't really spot anything else that's interesting. Anyone else? It's been pretty widely publicized that around 90% of Stack Overflow's traffic comes from Google. That means a lot of unregistered users coming to the site and viewing content, but I'd like to see stats on what other types of activity unregistered users are taking part in. What percentage of questions are posted by unregistered users? What percentage of answers are posted by unregistered users? I don't know if this is possible, but it would also be interesting to see at what point people typically register. After X questions posted? After they reach a certain reputation? We keep on getting questions about whether it's easier to gain reputation now that it was early on in the site's history. Average the above 48-day tally for each time period (monthly, weekly, whatever) and graph it. Break out the results by post type (question/answer) and perhaps by other interesting factors (whether the author was high rep or low rep, etc). Graph it so we can see if it's just our imagination, or if reputation really is harder to get these days. It would be nice to see a graph like this, but with the average number of views each question gets in the first couple of weeks after it's asked (say 1 or 2), in stead of over all time. What share of the up-votes come from competing answerers? Preamble: I frequently get the impression here on Meta that there are great differences in perception of what constitutes typical SO activity. One person thinks that questions from newbies get closed too quickly; another argues that there are dozens of basic duplicates a week, and they aren't getting closed fast enough. I'm not concerned with these specific arguments at the moment. What I want to know is, how focused, or how generalized, are the members of SO? How much segregation into major tags is there, in fact? This is what I've come up with to look at that question. I'd like to see a series of N histogram graphs. Take some number X of the most popular tags. (I don't have a clear idea how many X should be; there's 36 on the first page of the Tags tab, so probably no less than that, but I'll leave that to you.) On each graph n, display the number of members y who who have at least n votes in x of the top X tags. I'd probably expect n to increase in a super-linear fashion (10, 20, 50, 150? ), depending on how many graphs you feel like producing. I'm no statistics wiz, so if there's a better way to display this info than what I've thought up, I'm all for it. Also, if anyone else is interested in this segregation question, and has a better idea for how to look at it, please comment! There's some intuitively obvious correlations among various tags, for instance, but it might be nice to see real data on that, too. I would like to be able to generate a Question Reputation Cumulative graph to analyze various community user's behaviors. Data set must contain the reputation level of the question and all its answer for each time component within the selected period. I would like to see stats on suggested edits, so we can know if more people should be able to see the list of suggested edits. I would like to see how many users SO has from countries where English is, and is not, an official language. Will this be possible? I know that migration will bring a lot of noise on such data, but I still think it will be interesting. How many votes do questions/answers see based on the time of day they were posted? Despite the response to my question on this topic, I still sense that having all votes reset on the same clock must adversely affect questions and answers posted during a particular portion of the day (when most people who vote have no votes left). It would be nice to know how strong is the effect of first up-votes on answers. Meaning, how often is it the case it's enough to get the first one or two votes among a few answers to win the whole 'race' (i.e. get the answer accepted or have the most number of up-votes after 2 days or a week). I was just thinking of asking for some statistics just 30 seconds ago for a paper I am writing . Ask and you shall receive I guess. Also I would like to see statistics that show the patterns over users and how they interact with the different SE sites. Hopefully I'll be able to create a user map that shows which type of users frequent which sites. Where these different types of users generally cross paths. I'm sure I'll think of some more useful things later. Maybe a bit vague, but I like to see the relation between proposed behavioural changes (for example the blog post to vote for questions) and the real behavioural changes. 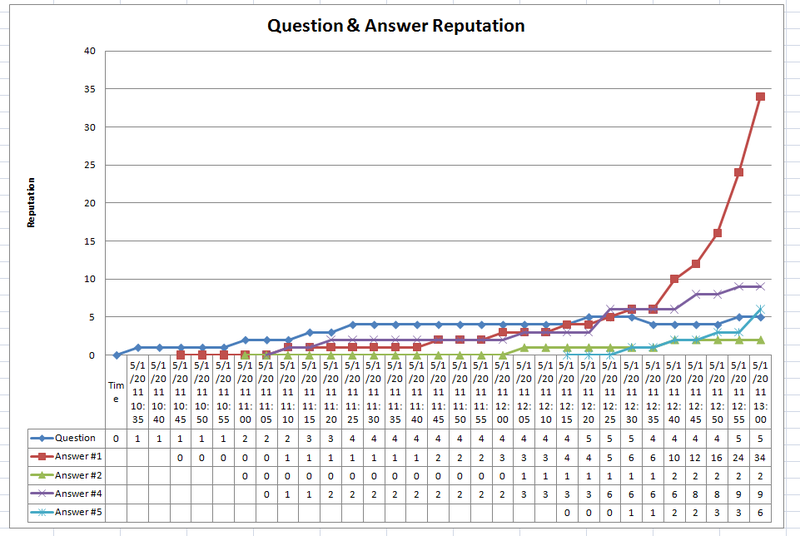 In this case, it should be easy, compare the relative number of votes on questions before and after. But the most interesting part would be to check if the change is lasting by monitoring it for a longer time. Another example would be the relative number of bad questions before and after the restriction on bad question. If several of these metrics are in effect over a longer time, it would be interesting to compare the effects of positive (rewards, badges, reputation) triggers and negative (question restrictions, penalties). 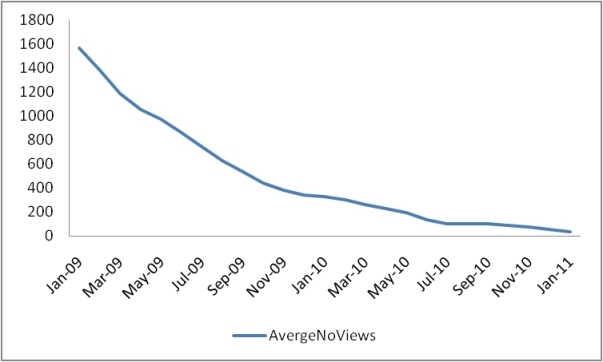 Many people believe that number of views drives everything else that we measure. The number of upvotes you might get for a question, answer, or comment, the number of answers the question attracts, the quality of the answers, and so on. That's why the main page landing view was adjusted - to try to get views to questions. I'd like to know if that is actually true. Is the range of "views per upvote" dramatically narrower than the range of upvotes? Can you see a similarity in the shapes of say views each day within a tag and votes or answers each day within that same tag? If it turns out views is overwhelmingly the driving factor behind all the other outputs, that drives a different set of behaviours than if you see some situations with the same view pattern but a very different pattern of votes or answers. I expect that before flag weight was visible, flags in each tag appeared in rough proportion to how many questions and answers there were in that tag, and who was following the tag. 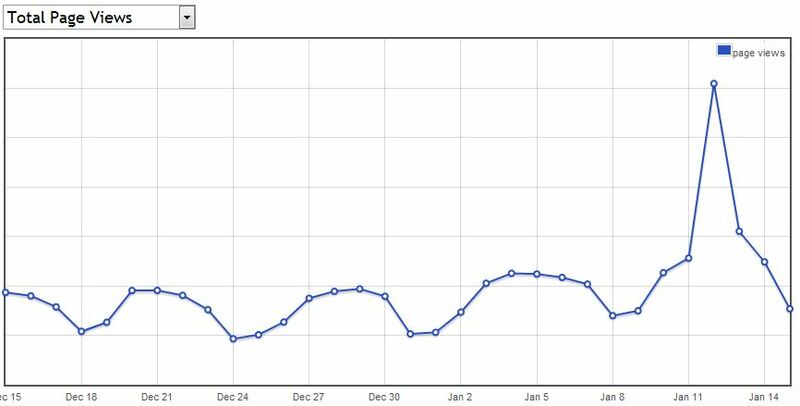 But with the rise of searches to find bad answers, and the review page gaining discoverability, flags probably started to appear in proportion to where bad posts were, which is different. Say almost everyone who posts in tag A is Doing it Wrong, and nearly nobody in tag B is, but B gets way more views and posts. In the old days, B would get more flags than A, but now I bet A gets more. Can you design a query that would test this? I would be interested to see the flagging distribution and trends over the last 3 months. How many people have flagged and how frequently. 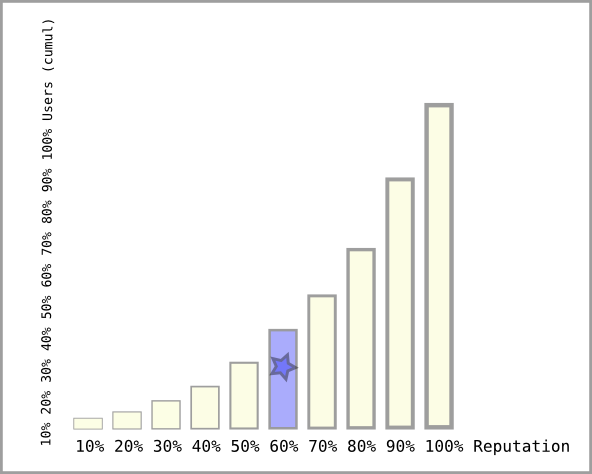 How many people have what success rates (ignore users who have only raised a few flags). Are people improving. For users that have raised at least 200 flags, compare the success rate of the last 100 to the success rate of the 100 before. I imagine these would produce nice bell curves (because bell curves are awesome) but I find my imagination is not nearly as informative as real data. I'd be interested in seeing some data comparing question voting counts both before and after making downvotes free. Also see if there's any correlation to closings and deletes. At this point in time, I wouldn't expect to see much yet since this was a recent change but it has already made a drastic change to my voting habits and I'm curious to see if the feeling is mutual. I would like to see referrer information for questions where I've made a post. Just today I had 4 votes on a answer I wrote over a year ago: it'd be awesome to be able to see what was sending new traffic to this old question. Average patterns across the day and week of when votes are cast on questions and answers. When are you most likely to see a flurry of upvotes or downvotes on a post? Before lunch? After happy hour? Views is one thing. But votes, baby, that's an action you get hit in the face with like a skin tag that comes off when necking. How has the site's "negativity" (which may be a good thing) changed over time? What percent of questions are closed and downvoted over time? What percentage are duplicates? This may provide insight into the maturity of a site. This graph would mean, that about 60% of the users have less reputation than you, and that these users together collected 40% of the reputation. An additional indicator (*) could locate an individual in a segment, builded by all the people in an 1% interval (this sample is with 10% intervals), which have a similar reputation - let's say - of 713 to 849 points. If you sort all those people by joining date, and indicate where in that section a person is, everybody above the middle (=average) would be a faster reputation earner, and those below the middle would be slower. (Updated, and replaced ascii-art with inkscape graph). It'd be interesting to see how much of a question's 100k+ views came from a particular source. Or to be able to see if a question that makes a reference to another existing question contributes to the view count of the question. This question had me thinking. With currently many registered users (not including previously active but now deleted users), I wonder how much of that are actually active users. It'd be nice to see a breakdown of how many users are actually active by "reputation class" (i.e., below 100, then up to 1k, then up to 5k, then up to 10k, etc.). Active meaning they've logged in and made a post (i.e., question, answer or comment) or any other action where a change is made to the public side of the site (changing the private profile doesn't count). If possible, do this for each month since the sites have started up. Maybe add account registration/deletion statistics, maybe even include unregistered users. I do not know if you are still producing graphs as offered, but here is someone you could help by producing a plot of time series (better: a dataset) showing how stats software fare at SO/SE (specifically, SO and CrossValidated). The tags: r, sas, spss, stata. This data is cumulative, but it would be very interesting to see how it grew by year. Without access to such data, at least we have the data in Fig. 1a to give us a feel for history. If you have time series data, please send it over to him! If you cannot send the data, you could also ask the SO/CV teams to get it for him :) Bob Muenchen will be finalising his analysis of stats software discussion in the coming weeks. Cherry on top: a crosstab of associations between the keywords. I'm pretty sure it would show that quite a few R questions are about transitioning from Stata. Not the answer you're looking for? Browse other questions tagged discussion stack-exchange statistics graphs . Can we have a way to see referrers for a specific question? Is there any analytics information that moderators can access for individual questions? Stack Exchange Community Statistics results: Which questions are the least frequently answered?